Dr. Shiau, is an Assistant Professor of Radiology, and Dr. Ko is an Associate Professor of Radiology, Department of Radiology, New York University Langone Medical Center, Department of Radiology, New York, NY; Dr. de Groot is an Assistant Professor of Radiology, Department of Radiology, Virginia Commonwealth University Health System, Richmond, VA; and Dr. Godoy is an Assistant Professor of Radiology, Department of Diagnostic Radiology, The University of Texas M.D. Anderson Cancer Center, Houston, TX. Aortic imaging has dramatically changed over the past 20 years. Previously, diagnosis relied on chest radiography and catheter angiography. 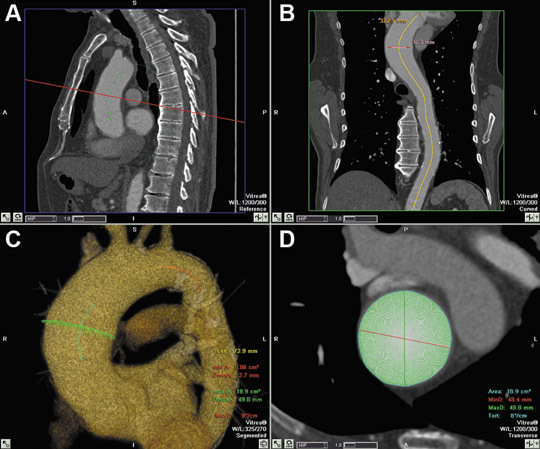 However, the sensitivity of chest radiographs for acute aortic syndrome is limited and now multidetector CT (MDCT) enables noninvasive diagnosis of AAS without invasive catheter angiography. Magnetic resonance imaging (MRI) has higher sensitivity and speciﬁcity but is less practical in the group of patients assessed for acute aortic symptoms who are potentially unstable and critically ill. The MDCT protocol approaches 100% sensitivity and speciﬁcity4 and is accepted as ﬁrst-line imaging for suspected acute aortic disease. 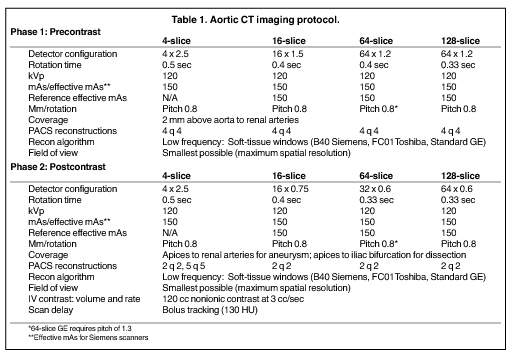 CT imaging (Table 1) consists of precontrast and arterial-phase imaging using bolus tracking to optimize aortic enhancement. Precontrast unenhanced scans may be performed using a low-dose technique (decreased mAs) to delineate calciﬁcations and detect IMH. For contrast enhancement, a premonitoring CT section is selected through the aortic arch based on the frontal scout image. A region of interest is placed within the lumen of the thoracic aorta, and the scan is triggered after a designated threshold in Hounsﬁeld units (HU) is reached during dynamic imaging. In patients with acute aortic abnormality involving the distal descending aorta, the scan is often extended to the level of the aortic bifurcation for more complete assessment. Intravenous contrast administration may be followed with a saline bolus (30 mL normal saline) using a ﬂow rate of 3 to 4 cc per sec for optimal enhancement. A saline bolus after contrast decreases the amount of streak artifact as it leads to rapid contrast washout within the superior vena cava, resulting in a more coherent bolus delivery. 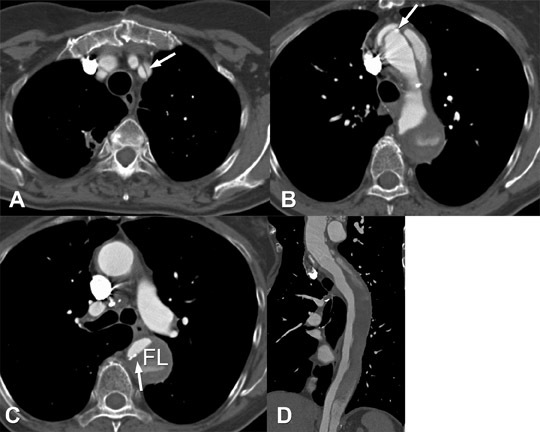 Delayed CT imaging is not usually performed for suspected acute aortic injury, but is routine for assessment after aortic surgery or endovascular repair. In our institution, 2 mm to 4 mm slices are sent to the picture archiving and communications system (PACS) for interactive analysis. Additional left anterior oblique (LAO) 45-degree multiplanar reconstructions (MPR) are routinely created by the CT technologists and sent to PACS for review. These LAO MPRs are useful for demonstrating cranial-caudal extent of the aorta on 1 image. These images are created by placing the reconstruction plane parallel to the aortic arch resulting in the familiar “candy cane” view of the aorta (Figure 2). Thinner (1 mm) reconstruction images are sent to a workstation for 3D reconstruction. Previously considered optional, reconstructions have become routine and are expected by the referring physicians for pretreatment planning. Semiautomated software is currently available that generates maximum and minimum bidimensional measurements of the aortic lumen in cross-section (Figure 3). Curved planar reconstructions (CPR), shaded surface display, maximum intensity projection (MIP), 2-dimensional oblique and 3-dimensional volumetric images are routinely created. Dissection occurs when a laceration in the aortic intima allows pressurized blood to enter into and dissect between layers of the aortic media, forming a second or false lumen (as opposed to the true lumen). The points of greatest hydraulic stress in the aorta are the most common locations of intimal tearing: the right lateral aspect of the ascending aorta and the descending thoracic aorta proximal to the ligamentum arteriosum.7 Systemic hypertension is the most frequent factor predisposing patients to aortic dissection. Other important etiologies for development of aortic dissection include de novo intramural hematoma with back rupture into the aortic lumen with subsequent blood ﬂow into the media and cystic medial necrosis, as seen with Marfan’s disease. The most widely used classiﬁcation system for dissection is the Stanford classiﬁcation: a dissection in the ascending aorta is considered type A and dissection in the descending aorta distal to the left subclavian artery origin is considered type B.
Dissection is diagnosed on contrast-enhanced CT angiography (CTA), which allows visualization of both true and false channels, the intimomedial ﬂap, and often, the intimal tear. In the aortic arch, the intimal tear is often best seen on the LAO 45-degree projection. The term intimal ﬂap is a misnomer; the ﬂap is composed of both media and intima, therefore the term intimomedial ﬂap is preferred. 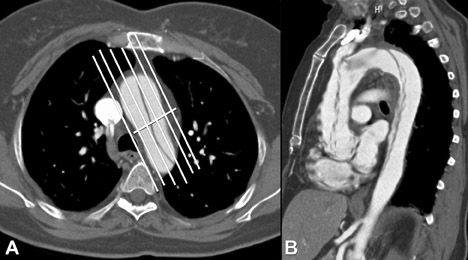 Pulsation artifact in the proximal ascending aorta can mimic a dissection ﬂap.4 The use of ECG gating can reduce or eliminate this potential false-positive ﬁnding although there is a tradeoff with radiation exposure (Figure 4). Clues to pulsation artifact include multiple, peripheral, curvilinear low-attenuation densities within the aorta as well as duplicated margins within adjacent cardiac chambers. With newer technology and subsecond scanning, this pitfall is less prevalent. ECG gating for aortic CTA can be used in cases of Marfan’s syndrome or other connective-tissue disorders which have a higher incidence of proximal dissection involving the aortic cusps or the sinotubular junction. In addition, ECG gating allows for more accurate measurement of the aorta. Other potential abnormalities mimicking aortic dissection on axial images include coarctation, pseudocoarctation, saccular aneurysm and pseudoaneursym. MPRs will usually clarify the ﬁnding and lead to the correct diagnosis (Figure 5). Differentiation of the true from the false lumen is crucial for planning possible endovascular intervention. The true lumen is contiguous with the nondissected portion of the aorta and is usually smaller and more opaciﬁed than the true lumen during the angiographic phase of imaging.6 The false lumen is often located between the 9:00 and 12:00 positions along the aortic lumen circumference of the ascending aorta and between the 3:00 and 6:00 positions in the descending aorta.8 Although these features are helpful to distinguish between true and false lumens, they are not reliable. The most reliable sign to identify the true lumen is the presence of calciﬁcation in the periphery of the aorta (in the nonintimal ﬂap side). The false lumen may be partially thrombosed demonstrating both slow ﬂow and thrombus9 (Figure 6). Other signs of the false lumen include the cobweb sign, which are linear densities within the opaciﬁed false lumen due to incompletely detached threads of aortic media, and the beak sign, which is when an angle is formed by the intersection of the intimomedial ﬂap and outer wall of the false lumen.6 A true lumen that is completely collapsed should not be mistaken for eccentric thrombus8 (Figures 7 and 8). An uncommon variant of dissection is intimointimal intussusception, in which a near 360-degree circumferential tear leads to central displacement of the intimal-medial ﬂap. The etiology is usually a Stanford type A lesion in the aortic arch. In this case, the central lumen is invariably the true lumen.7 Obstruction of the great vessels is a potential complication9 (Figure 9). The complications of aortic dissection include: aneurysm formation, rupture, continuation of the dissection into the pericardium with or without tamponade, and extension into the carotid or coronary arteries causing stroke or myocardial infarction, respectively (Figure 6). Renal and mesenteric ischemia may occur from hypoperfusion due to dissection extension into branch vessels or branch-vessel perfusion via a less perfused true or false lumen. Dynamic occlusion can lead to end-organ ischemia if the intimal ﬂap spares the branch vessel but repetitively prolapses and intermittently occludes its oriﬁce.6 A rare complication of a Type A dissection is rupture into the mediastinum. 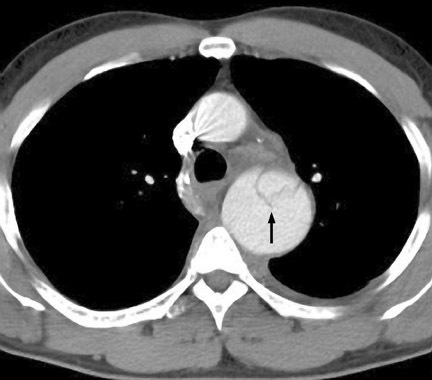 When this occurs, the mediastinal hematoma can dissect into the shared adventitia surrounding the pulmonary arteries and cause marked compressional narrowing (Figure 10). 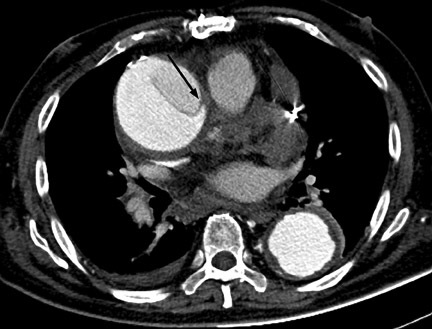 Intramural hematoma (IMH) may be considered a variant of aortic dissection. It is the result of hemorrhage within the media from rupture of the vasa vasorum in the absence of an intimomedial tear in the setting of hypertension or trauma. Hypertension plays a major role in the pathogenesis of injury to the media. It contributes to spontaneous rupture of the vasa vasorum and mechanical strain on the aortic wall, both of which may lead to an intimal tear. IMH may also be caused by focal penetrating ulceration in an atherosclerotic plaque or thrombosed dissection lumen (Figure 11). Clinically, IMH and dissection cannot be differentiated. As a result, all scans to exclude an aortic dissection should include precontrast imaging to evaluate for possible IMH. In the acute presentation on MDCT, there is a relatively circumferential crescent or ring-like hyper-density along the margin of the aorta, mimicking a“thickened aortic wall.” The high attenuation is best appreciated on precontrast imaging. There is no evidence of ﬂow within the abnormality. Intramural hematomas do not enhance following intravenous contrast administration. Differential diagnosis for intramural hematoma includes entities that cause aortic-wall thickening such as aortitis, mural (intraluminal) thrombus and soft atheromatous plaque. Acute IMH may be a precursor to fusiform aneurysm, dissection or pseudo- aneursym. Approximately 2% to 20% of IMH results in acute aortic dissections as a consequence of penetrating ulceration. One proposed mechanism for the development of dissection from a preexisting IMH involves aortic branch artery pseudoaneurysms. These lesions mimic penetrating ulcerations and associated IMH, but they actually represent focal, mural pseudoaneursyms. Shearing injury is caused by the propogation of hematoma across the origin of the branch vessel; the origin of the intercostal or bronchial artery is thus“interrupted” resulting in a focal, high-attenuation, rounded focus, which is contiguous with the extra-aortic tubular course of the vessel (Figure 12). Because of the mechanism of injury, these pseudoaneursyms do not appear along the pleural surface of the aorta, which distinguishes them from penetrating ulcerations10 (Figure 13). Approximately 10% of IMH will regress (Figure 14), but progression is seen in 20% to 45% of patients.2 Subacute or resolving IMH becomes isodense to blood on precontrast CT and slowly decreases in size. Clinical presentation includes chest or back pain similar to other causes of acute aortic syndrome, but these patients are usually not hypertensive. As delineated above, penetrating ulceration, intramural hematoma and aortic dissection are inter-related, may coexist, and have a causal relationship. Although each may occur spontaneously, penetrating ulceration may lead to either or both IMH and aortic dissection. Spontaneous IMH may lead to dissection. 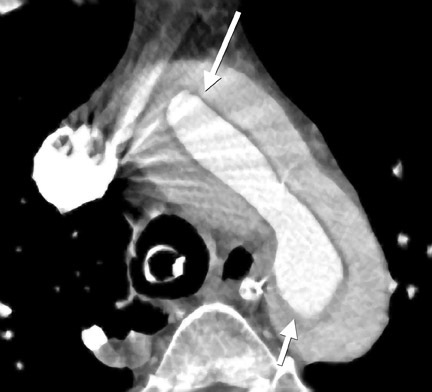 The thrombosed false lumen of a classic aortic dissection represents IMH. These diseases are not static and may progress with time. PAU, as well as dissection, may lead to pseudoaneursym formation, which may necessitate repair. Both true aneurysms and pseudoaneursyms may lead to aortic rupture. CT plays an important role in the diagnosis of acute aortic syndromes. Vilacosta I, San Ramon JA. Acute aortic syndrome.Heart, 2001;85:265-268. Salvolini L, Renda P, Fiore D, et al. Acute aortic syndromes: Role of multi-detector row CT. Eur J Radio. 2008;65:350-358. Macura KJ, Corl FM, Fishman EK, et al. 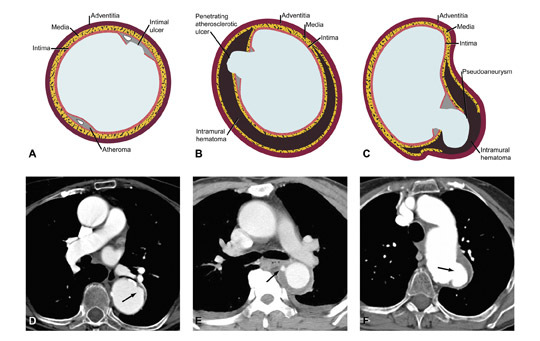 Pathogenesis in acute aortic syndromes: Aortic dissection, intramural hematoma, and penetrating atherosclerotic aortic ulcer.AJR Am J Roentgenol. 2003;181:309-316. Manghat NE, Morgan-Hughes GJ, Roobottom CA. 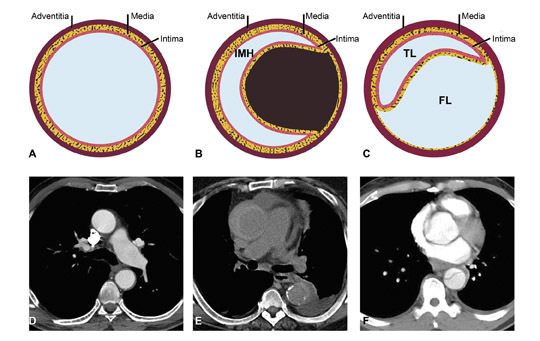 Multi-detector row computed tomography: Imaging in acute aortic syndrome. Clin Radiol. 2005;60:1256-1267. Chughtai A, Kazerooni EA. CT and MRI of acute thoracic cardiovascular emergencies. Crit Care Clin. 2007;23:835-853, vii. Smith AD, Schoenhagen P. CT imaging for acute aortic syndrome. Cleve Clin J Med. 2008:75: 7-9,12,15-17 passim. Castaner E, Andreu M, Gallardo X, et al. CT in nontraumatic acute thoracic aortic disease: Typical and atypical features and complications. Radiographics. 2003;23:S93-110. Bhalla S, West OC. 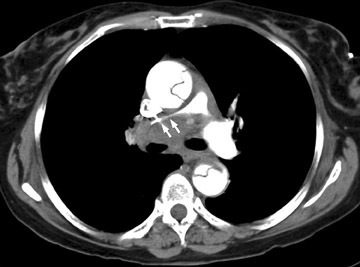 CT of nontraumatic thoracic aortic emergencies. Semin Ultrasound CT MR. 2005;26:281-304. Macura KJ, Szarf G, Fishman EK, et al. Role of computed tomography and magnetic resonance imaging in assessment of acute aortic syndromes. Semin Ultrasound CT MR. 2003;24:232-254. Williams DM, Cronin P, Dasika N, et al. Aortic branch artery pseudoaneurysms accompanying aortic dissection. Part I: Pseudoaneurysm anat-omy. J Vasc Interv Radiol. 2006;17:765-771. Stanson AW, Kazmier FJ, Hollier LH, et al. Penetrating atherosclerotic ulcers of the thoracic aorta: Natural history and clinicopathologic correlations. Ann Vasc Surg. Singhal P, Lin Z. Penetrating atheromatous ulcer of ascending aorta: A case report and review of literature. Heart Lung Circ. 2008;17:380-382. Cho KR, Stanson AW, Potter DD, et al. Penetrating atherosclerotic ulcer of the descending thoracic aorta and arch. J Thorac Cardiovasc Surg. 2004;127:1393-1399; discussion 1399-1401. Gottardi R, Zimpfer D, Funovics, et al. Mid-term results after endovascular stent-graft placement due to penetrating atherosclerotic ulcers of the thoracic aorta.Eur J Cardiothorac Surg. 2008; 33:1019-1024. Coady MA, Rizzo JA, Elefteriades JA. 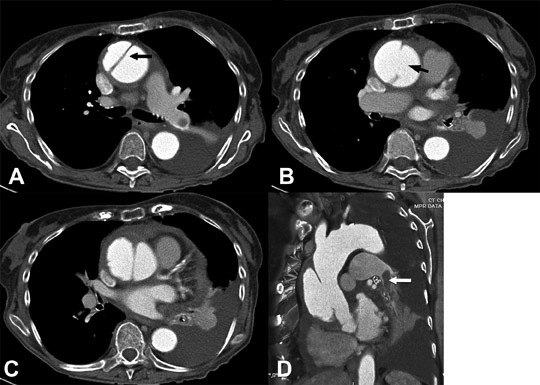 Pathologic variants of thoracic aortic dissections: Penetrating atherosclerotic ulcers and intramural hematomas. Cardiol Clin. 1999;17:637-657. Mitchell RS, Dake MD, Sembra CP, et al. Endovascular stent-graft repair of thoracic aortic aneurysms. J Thorac Cardiovasc Surg. 1996; 111:1054-1062. Macura KJ, Corl FM, Fishman EK, et al. Pathogenesis in acute aortic syndromes: Aortic aneurysm leak and rupture and traumatic aortic transection. AJR Am J Roentgenol. 2003;181:303-307. Thoracic aorta: Acute Syndromes. Appl Radiol.